If you are like most of us, rarely do you think about your electrical system. It is something that is in the background of your life; it is a modern day convenience that we subconsciously take note of every time we enter a dark room, that we are thankful for as we take shelter in our home from the heat or cold, and the thing we rely on when we need to charge our phones and other personal electronic devices. Our Colorado Springs homes and businesses wouldn’t be the same without electricity. Many of us know this and hope that we never have to live without it. However, when our electrical system seems to not be working or we want to remodel our kitchen, we realize its complexities and are reminded of how different our lives would be without it. Our electrical system does much for us that most aren’t aware of. As we discussed above, it’s easy to forget about all that makes our electrical system and every single component that enables us to have light at a flip of a switch. Thankfully, most us in Colorado Springs don’t have to worry about not having electricity. However, when we encounter a problem, it’s difficult to know who to call and when to bother calling in a professional, because we know that no matter the issue, if we have to consult a contractor of sorts there will be a price tag attached. Below are some tell-tale signs that can clearly show when you may want to call your local electrician. If you are constantly tripping the breaker or blowing a fuse, you will want to give an electrician a call. Having to regularly reset the breaker or replace a fuse is not normal and may mean that your system is drawing more current than it can safely feed. If you are experiencing this problem, do not wait to call an electrician. Having an overloaded system can put your home and family in danger. Do your lights flicker or dim when you use your microwave or your air conditioner powers on? If this consistently occurs, you may need to call us. When lights flicker or your appliance slows when other appliances turn on it may be a sign that a particular unit is requiring more electrical current and will need it’s own dedicated circuit. To avoid further problems or a danger, contact your local electrician right away. Does your home have outlets that only work with two-prong plugs? Or do your outlets in your bathroom lack GFIs? If you can answer yes to either or both of these questions then you may need to consider an upgrade. Many electrical codes were implemented after many older homes were built, and so many older homes lack the modern fail-safes that newer electrical systems were built with that not only support modern electrical needs, but also protect from electrical fires. Old electrical outlets and outlets lacking GFIs in bathrooms should be replaced immediately to avoid overloading and, as mentioned before, possible electrical fires. Extension cords are a great invention. They allow us much convenience. However, having more than a few extension cords as part of your electrical setup isn’t the safest or most efficient option. If you’re finding that you have extension cords running under rugs and along the bottom of your walls, give your local electrician a call! They can not only help you to be safer through installing more outlets, but also look better! Are your outlets, electrical panel, switches, or other electrical components warm to the touch? If they are, you may have an issue with your electrical system. Warm outlets and the like indicate that there is an excessive demand for electricity on the circuit. Older homes with aluminum wiring can be particularly susceptible to being unable to accommodate demand. Call an electrician right away if this is the case! Is your home’s main electrical panel rusty or covered in moisture? If it is, there is a good chance that not all is right with your panel and even your entire system. Generally, moisture should not be accumulating in your home. Getting to the bottom of the issue is paramount. Contact us right away if you see even the beginnings of rust. Remodeling projects and renovations can also be a great time for calling your local electrician. Not only can they advise as to how to accommodate the changes that you will be making with your appliances or lighting, but they can help you see remodeling options that may have not been clear before. They will not only be able to advise you, but to help you with the actual electrical work that will need to be installed, updated, or altered. Have you ever felt like your home needs a facelift or it just feels dull? It may be time for a remodel. Though it can be easy to simply change the colors of your walls or to pick out new drapes, the best ways to invigorate your home and help you fall in love with it once again is through a kitchen remodel or bathroom remodel. These are two areas of our homes in Colorado Springs in which we spend a lot of time and are the ones in which the potential to look the most outdated is greatest. The first aspect you must think about before anything else—before you even start choosing your new dining room table—is your kitchen’s layout. Whether you are an amateur cook and have a place for all your special cooking appliances and tools, or you only occasionally throw on your apron, the layout of your kitchen is important. The most important thing to consider is the “kitchen triangle” which is the path from the fridge to the sink, to the stove, and back to the refrigerator. If this path feels awkward or doesn’t even resemble a triangle, then you may want to reconsider the layout. Before you start pulling up old vinyl flooring or installing granite countertops, you need to ask yourself if you want to upgrade your appliances. New appliances could mean that you need to alter your current electrical system, you may need a larger hole than was needed to house your older fridge or microwave. It is easy to think that upgrading your appliances later is best, but not having a kitchen designed around your appliances can limit what you can do or what appliances you can buy in the future. Also, picking out new appliances now can help you know what style of cabinetry to choose and how you want to style your entire kitchen. Upgrading your appliances can not only increase your enjoyment of your kitchen, but also your kitchens energy efficiency, which can save you hundreds of dollars in the long run. As you consider upgrading to energy-efficient appliances, you may want to also consider your lighting. Are you ready to invest in some new lighting that may be more energy-efficient or fit more of your new style? Do you like your lights, but need more natural lighting? Maybe it’s time for a skylight or two or to invest in bigger windows. Lighting can not only make a statement, but add to the overall feel of your space. Places in our homes that have very little light can feel cave-like and induce a sense of claustrophobia. Uniquely styled lights can add a modern touch to any kitchen and can make the kitchen the place that everyone wants to hangout. You also need to decide on your cabinetry. If you’ve decided on a layout and your appliances, you will most likely have a clear idea of what size, type, and style of cabinets you will need. However, you will also have to decide if you are going to install custom cabinets or prefabricated cabinets. Knowing if you will need some custom cabinetry can be determined by the possibility of prefabricated cabinets fitting in your current kitchen layout and the overall flow of the kitchen. You must consider where you want to keep your dishes, small appliances, utensils, and other cooking essentials as you’re looking into cabinetry, as well as which way the cabinet doors will be opening. Thinking about your counters is an important aspect of your remodeling thought process. Installing granite countertops can be an upgrade that can take your kitchen from blah to a luxurious and stylish “ten.” However, granite can be expensive as well with some maintenance. If you’re not sure about granite, concrete or stone countertops could be a wonderful alternative. Your countertops aren’t just the place where you set your dishes or work on a decadent family meal, but they can also make a statement and add dimension to your kitchen’s overall design. Ultimately, as you remodel your kitchen you must find a balance between your needs and also creating a space that will positively contribute to your home’s resale value. Pouring money and time into not only the design process, but also the actual remodel can be an investment yielding years of enjoyment, as well as the possibility of greater resale value. The bathroom, like the kitchen is one of those places in which we spend a lot of our time and is one of the rooms in our Colorado Springs home most susceptible to becoming outdated and needing more than a coat of paint or a set of new towels to make it an enjoyable place to be once again. Before you start ripping out your tiles and buying paint, it is best to consider the changes that you want and need to make to your bathroom. Upgrading your plumbing during a renovation is a good decision because if there is a problem with your plumbing and you have already completed your renovation, you will be spending even more money not only fixing the plumbing issue, the damage it may have created, but also ripping out work already completed and restoring the remodeling. If you have an older home in Colorado Springs, consider having a plumber look at your pipes and see if they need some love or an upgrade. Do your pipes get clogged easily? You may be able to upgrade to a larger drain! The lighting in your bathroom can make a big difference in how your bathroom feels, the mood it emanates, and its usefulness. Soothing lighting can make all those relaxing showers or baths be even more enjoyable. Lighting that is of the right color and brightness can assist in proper makeup application. Instead of having to choose between one light or another, consider installing multiple lights or ones that are adjustable. As you’re choosing your lighting, you may want to consider other similar upgrades and how this could affect your electrical system. Speaking to an electrician before a remodel can be incredibly helpful and may present options that would otherwise not have been considered. Does your bathroom have enough storage? Is your storage convenient? It might be time for an upgrade! Thinking about your storage needs and possibilities is something that you must consider before you begin your renovation. A bathroom with the right lighting and with upgraded tile is nice, but if your storage isn’t working for you or all of your toiletry items are on the counter, you will probably be unhappy; all the luxurious upgrades in the world won’t make up for inconvenience. Though DIY-ing your remodel can be an admiral thing to do, DIY-ing your electrical system for your bathroom or kitchen—two places in your home that rely the most on electricity—isn’t advised. If you get it wrong, you could not only have a room without power, but it may also ruin an expensive appliance or worse, cause an electrical fire. Also, if you get it wrong and must have it fixed, you may have to rip out your remodel and all its expensive finishing elements. Additionally, you may have days more of your home being ripped apart and perhaps unusable. 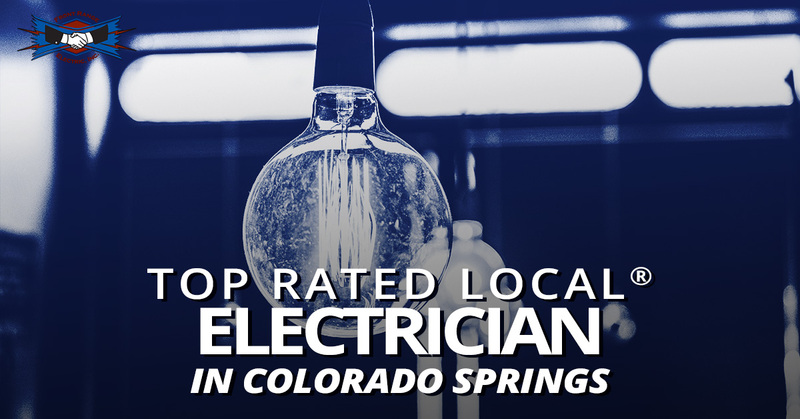 Contact your Top Rated Local® Electrician in Colorado Springs today!